This is a evolving series of notes originally prompted by a telemarketing call selling solar installation. NZ Home Services have a web site HERE, but it doesn’t work for me (tried 2 browsers, displays nothing at all). The web site did work on a tablet but was not very informative. They have a short promotional Youtube video HERE. They had a number of system packages with the option to pay off over 40 months. The point was made that they only use Tier 1 solar panels (see notes below). A 3KW system consisting of twelve 250 watt panels costing $13000 or $82/week for 40 months ($13280). Considering that I wasn’t going to buy a system, we didn’t talk details, but the rep was friendly and seemed keen to provide a good system. If you are interested in solar power and longer term savings it’s probably not a bad deal. But the benefits will vary with your power use; how much and when. The sales pitch suggests that the power generated averaged over the year will be the peak rating of the system x 5 hours per day. So a 3KW system will produce 15KWh per day x 365 d/y or 5475KWh. To buy 5475KWh would cost us just over $1000 at todays prices (exc. line charges). Based on my experimental solar panel, my gut feeling was that “rating x 5 hours” may be slightly high for Wellington; but I don’t have any numbers to back that up. If you work during the day when solar generation is at its peak, more power is sold back to the grid at a lower price; 7-8c/KWh. If you work from home as we do, our power use is more even throughout the day, but is not 3KW, so some would still go back to the grid. 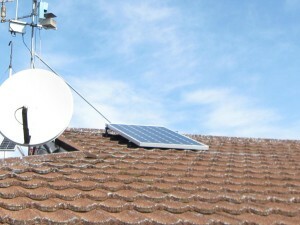 So you need to ask – Is the main benefit from reducing your power bill or selling excess power back to the grid. If you sell most of the daytime generation back to the grid, the benefits will be less. Likely doubling the payback period. I had to look this up, and found that it is not a reference to panel performance or quality. It is a rating system that defines the financial stability of the manufacturer. It could be argued that if the manufacturer has a history and is financially stable, then the product should be of good quality. The warranty is only as good as the operating life of the supplier and installer. If the installer is no longer operating, you are unlikely to be able to claim on the warranty. If you don’t use the power or don’t get paid a reasonable amount for power you feed back to the grid, you are probably not making good use of the power available and won’t have a reasonable payback period. Your load should be matched to your system or you need to store the excess for night-time use. Grid-Tie systems are popular because they don’t need batteries, which are very expensive and can be troublesome. A suitably sized battery system will allow you to go Off-Grid, eliminating line charges, but that requires a larger solar system and a large battery system. 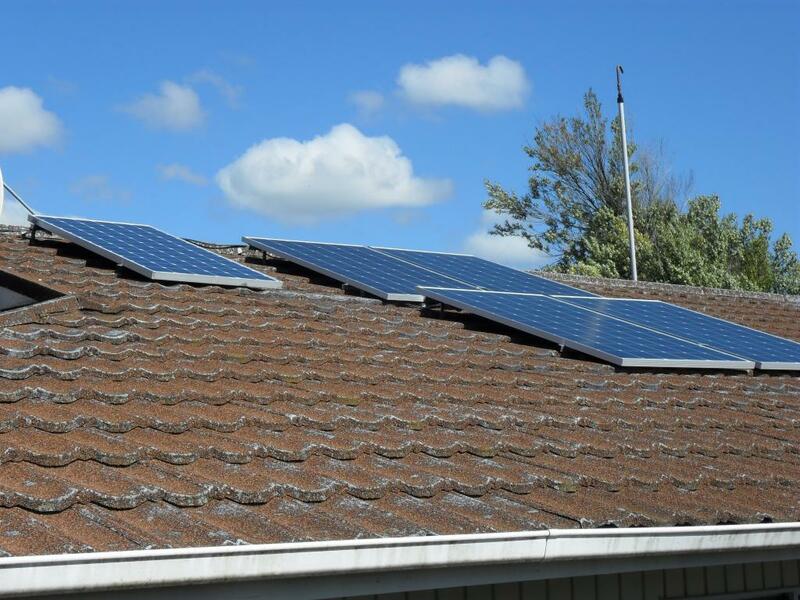 Most homes and life styles are not energy efficient enough to be able to comfortably go solar and off-grid. Batteries are very expensive, require maintenance and will have to be replaced sooner than other parts of the system. Therefore to minimize the battery capacity required you should be as energy efficient as possible. Reducing energy use is quite complicated – much more so than swapping out some LED light bulbs. My own research (September 2017) suggests that wet or flooded lead-acid batteries are still the best for life expectancy (with regular maintenance) and therefore more cost-effective. You will need more capacity than you expect to use because running the battery bank below 50% capacity will reduce it’s life. 150% capacity may be a good trade-off. It is possible that the bigger the battery capacity relative to normal load the more years it will last because it is not being so deeply discharged. I have about 230Ah of flooded battery and 50Ah of sealed battery, but I cannot connect them together due to the different charging requirements. Sealed batteries should not be overcharged, equalized or boost charged without careful planning and supervision, because gassing and loss of electrolyte will reduce their life. Flooded cells can be charged harder and the electrolyte level topped up as needed. You need a smart charging system. Assuming flooded cells – you take power out at night and expect it to be replaced during the day. The solar charger must apply more power to the battery than was taken out to fully recharge it – but how much is that. The charger can boost-charge at a higher voltage for a time but for how long. Applying a lower charge voltage such as float-charge will recharge the battery very slowly and waste available solar power. The trick is to work out how long to apply boost-charge. Our overnight load is a reasonably steady 6A at 24V and at the moment (summer) the batteries supply this for 10-12 hours. On a fine day the solar can easily boost charge at 15-20A, so it probably needs about 5 hours of boost to keep up. Any overcharge is like equalization and makes the batteries gas, which is not too much of a problem if the electrolyte levels are maintained. Sealed batteries could regularly be overcharged and suffer reduced life. I’m glad I didn’t get sealed batteries. The ideal system would monitor the load and keep track of the battery state so that it knows how much to put back when the power is available from the solar. As at late December 2017 I have a PWM charger (190W panel) operating in parallel with a EPever Tracer 30A controller with just over 1KW of panels. The PWM controller does not boost-charge, but the charge voltage can be set a bit high, which is not a problem considering the load and smaller solar panel. The problem I have discovered with the EPever controller is that it will equalise and boost-charge for a maximum of 3 hours each. This is not long enough as it switches to float-charge late morning when solar has not yet reached peak output. The long afternoon of maximum solar power is mostly wasted having switched to float-charge. This leaves the batteries badly under-charged. We work from home and have computers and a couple of monitors running 24/7 or for many hours a day. This accounts for a significant part of our power use. As at September 2017 we are with Mercury Energy and have been for a year or so. For 2017 the total paid includes GST (tax) and a 0.15c/KWh Electricity Authority Levy (another tax). I estimate that without changing our power use significantly, we would need at least 6KW of solar panels and 1000Ah of battery at the 24V already operating. Using more of the same 270W panels would mostly cover 2 sides of roof with half of it facing the wrong way and being less effective. We could probably reduce our power use by 50% by adjusting hours of operation and more efficient computers. This would probably make going off-grid feasible. Equipment prices are dropping but I suspect installation cost is increasing. 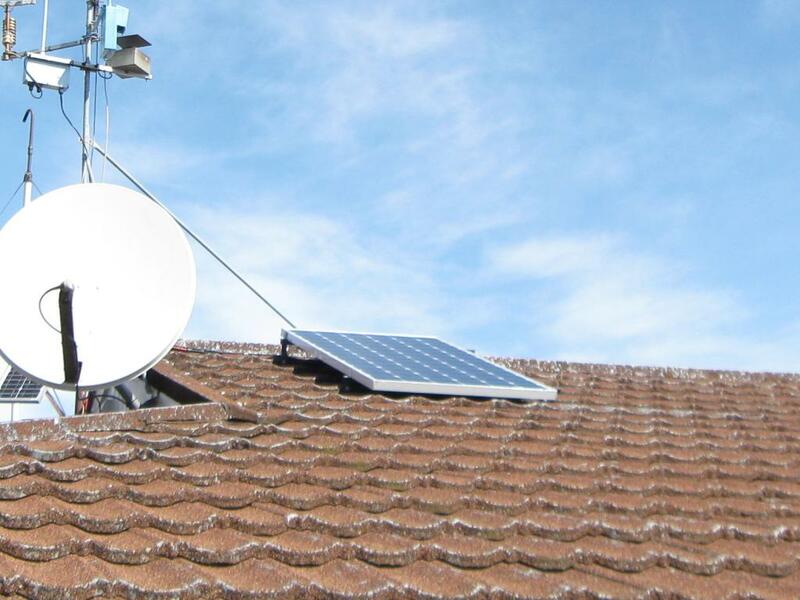 Is $13000 a reasonable price for a 3KW grid-tie system as at January 2016 ? It’s difficult to say because there are so many options of panel and inverter. A complete system consists of a number of parts and installation. The panels themselves are not necessarily the most expensive part. Panel mountings are expensive as is a good inverter. Installation probably also accounts for a fair chunk. This totals $9700, which is about the $10000 mentioned on other suppliers sites for a 3KW system. I’d expect a regular installer to be able to get better pricing than this, but $10000 installed would probably be reasonable at early-2016 prices. Apparently a 3KW system is typical and a 6KW system considered larger. Assuming 250W panels, 12 panels would be required for a 3KW system. 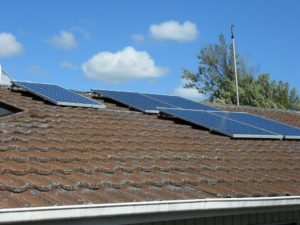 Assuming you spend $13000 for a 3KW solar system, how long will it take to pay for itself and what will it cost to maintain over the 25 year life of the panels? The panels will have to be cleaned maybe once a year. The panel mountings will have to be checked for corrosion and security every 5 or so years. The inverter will probably require service or replacement in 5-10 years. Cabling, if installed responsibly should last the full 25 years. In 10 years it is likely that panels and inverters will be cheaper and more efficient, and that service labour will be more expensive. I starting with one 190W 24V panel. On a clear sunny day, early afternoon, one 190W panel produces up to about 160 watts using a PWM controller. At typically 145W output and a grid power cost of 17.58c/KWh (+tax) the panel produces about 2.5c worth of power per hour. Assuming a good average day of output I estimate a payback period on the panel of 5-7 years. This does not include the cost of controller, cable, mountings or installation. So the actual payback may be more like 10 years. This one panel was supplementing grid power to a couple of low power computers, including this web server. No grid-tie or inverters. It is all a 24V system. Mid 2017 I added two 270W panels and a 30A MPPT charge controller to the 24V system. This was just hooked up to the existing system. It’s interesting to note that the original PWM controller does all it can and the MPPT controller tops up from there, leading to the larger panels doing less of the work. But in less than optimum conditions, the MPPT system takes over and is better than the PWM system. It is also interesting that when the MPPT controller boosts the battery voltage late in charging, the higher DC voltage helps the PWM controller deliver more efficiently than it can on its own. On ideal summer days I do see just over 200 watts of output from the PWM controller with just one 190 watt panel. When the battery voltage is up around 28.8V the PWM controller and 24V panel do well as the MPP voltage of the 190 watt panel is about 30V. The gear tray is hinged for easy battery access, would mount four 30A charge controllers and is fitted with a 12V regulator and two temperature controlled fans. 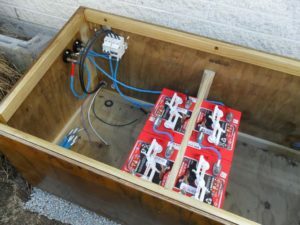 Early 2018 I moved the 30A MPPT charge controller from inside to outside in the battery box to be as close as possible to the batteries. 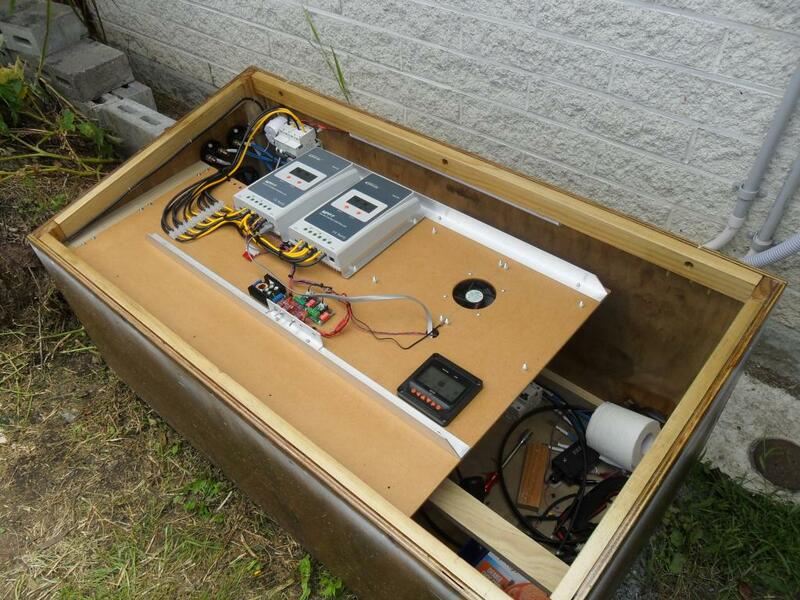 This required re-routing the panel wiring and adding an equipment tray to the battery box. The batteries do gas, so when adding equipment ventilation must be carefully considered. Having the charge controller mounted about 6 meters from the batteries meant having to use a lot of very heavy battery cable to minimise volt-drop. Volt-drop meant that the charge controller is not able to accurately monitor the battery state. as little as 0.2-0.3V drop can represent a large misreading of capacity. When moving the first charge controller to the battery box I added a second – for two Tracer A-series 30A controllers. These are connected to separate solar panels but to the same 24V battery. All load currently comes off the load outputs which are connected together and set manually to ON. It is interesting to watch the two charge controllers interact when connected to the same battery and load. They both have the same settings but do not evenly share charging and load supply. Sometimes the load output on one controller will shut off briefly, but they don’t both shut off at the same time. There isn’t an obvious pattern but they get the job done. The Flooded lead-acid batteries are boost charged for a couple of hours each day by the charge controllers. This works well to push quite a lot of energy into the batteries reasonably quickly. The trouble is that to really fully charge the batteries requires a lower voltage charge for a longer time and the day just isn’t that long if relying only on solar. Until I can sort this out I am occasionally float charging the batteries for a couple of days using mains power. More battery capacity may be part of the answer. As of early 2018 the solar capacity exceeds connected load, So on most days we are not using or storing all of the available power. This means that we are still using more grid power than we should. The charge controllers look after battery charging and the small steady load. When the batteries are recharged, usually by mid-day, the load on the panels drops off to a trickle charge and all of the summer afternoon solar potential is lost. I have several ideas in mind to improve this situation. Grid tie is not one of them as the sell back price is very low. During winter the extra energy could worst case be used for heating but during summer we don’t need air conditioning. Putting specific loads such as lighting and fridge-freezer onto solar would be one option but we need a safe fall-back to grid power without complex switching – and it must be legal and safe. A work in progress, so I won’t say too much just yet. With our local pcb manufacturer closing down I have the opportunity (necessity) to update some designs from simple single sided to double sided, plated-through and finer tolerances. This also allows more function in the same space and easier production. We have sold quite a few of the simple voltage sensor module to people assembling small off-grid power systems; camper vans, cabins and battery powered equipment. So I’ve spent some time recently working on the update. The original design works well for what it is and has a simple DIP switch to set the trip voltage and a single relay output. Simple but a bit of a PITA to set the DIP switches and a fixed restore voltage. Also requiring assembly of two versions, for 12V and 24V. The updated design has the same footprint but has a single 7-segment LED and rotary encoder for setup. This will allow trip and restore points to be set individually. It includes a temperature sensor on-board and the relay replaced with a solid-state output (open-collector). An auxiliary connector brings out 2 more outputs and 2 more inputs. I considered bigger displays, more digits or LCD, but decided it had to be same size-shape as the original, use readily available parts, have a low quiescent current draw and still be low cost. As well as the original low-voltage detector function, the updated version will be able to control a fan based on temperature and to drive separate high current switching to manage load and solar switching. This will make it more useful for vehicle systems with dual batteries and solar or alternator charging. Also for my type of solar-battery system with grid-power backup. Larger solar systems are already covered by the big and expensive charge controllers, but the smaller systems are often lacking or cobbled together from bits and way over-priced. We will also make a matching aux-relay board and a high current DC SSR for solar and battery switching. The SSR will be interesting, having to handle on/off and changeover with electrical isolation on the control side. I don’t want to use large relays or contactors as they are inefficient and long-term unreliable. The large loads we have are electric cooking and heating, including hot water. The biggest loads are short duration so the overall energy used by these is not large and hot water could be boosted with solar. This leaves most of our energy used by mains powered appliances, most of which have simple switch-mode power supplies. These are pretty bad for the mains, drawing most of their energy in short sharp bursts at the peak of the cycle – a story for another page. Improving these power supplies to improve power factor and reduce distortion and noise on the mains is a good idea. Unfortunately, not practical for most people to achieve. If you have battery storage it makes sense to use the DC power directly. This is not easily done in most homes. In our case 200 watts of computer load becomes 160 watts when powered directly from the 24V DC system. The conversion from 24V is more efficient than the 230V mains power supplies.